This figure template is suitable for designing clothes with interesting details in the back. Open back gowns, ties, cut outs, zippers and any detail that will make your design unique. The template shows the back view of the design as well as the side view. 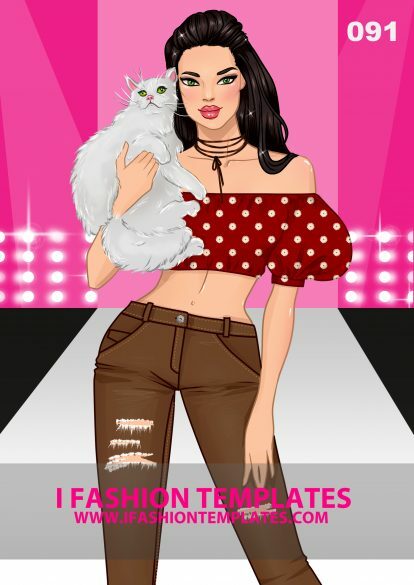 Use it to play with the side hеm of the pants or add a train to the dress. This fashion template allows designers to show in one illustration both the front and the back view of the design. The classic runway pose is ideal for any kind of design and shows equally well swimwear, formalwear and casual outfits. This group template combines a male and a female body base. Both figures are standing still and facing forward with their arms relaxed. This is an excellent template to design outfits for couples for either casual or formal occasions. Match elements of the clothing of the woman and the man, dress them in colors that work well together and be bold to play with the styling! This is a group fashion template featuring one front view pose and one back view pose. Both bases are with close set legs which allows for designing form fitting clothes, pencil skirts and mermaid gowns. Experiment with creating designs which look modest from one side and revealing from the other and have fun! Universal body template of a plus size figure that includes both front view and back view. The model has a curvy figure to help and inspire designers who create clothes for the everyday woman. Use the template to show beautiful design details at the back and accentuate the waits. This template is a must have for every fashion designer. It features three different points of view - a rare view, a side view and a front view. It is the perfect solution for elaborated design ideas that look different from all sides. This template is especially good for red carpet gowns and innovative designs that are beautiful from all sides. This new template allows you to presents your design idea in a new way. Use it to show the idea from far away and from close up. The pose will inspire you for innovative solutions at the back - straps, cutouts, patterns or bare back. Design bold dresses, casual clothes or lingerie. This is our figure template of kids of different age. It is deal for designing a kidswear collection where variety of age groups needs to be covered. The template includes one baby, one girl (6-8 y/o) and one boy (2-3 y/o) body template. 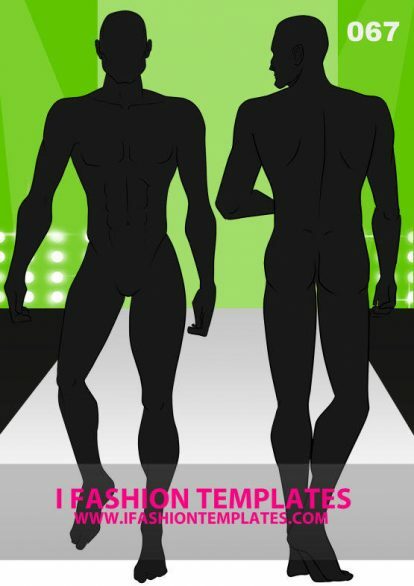 This fashion template combines our top products: front view male and a front view female on the runway. For those of you who wanted to express their creativity designing for couples! Use it to draw beautiful wedding outfits or casual attire. Show fabrics with movement as chiffon or silk and remember to match his tie with her dress color. This grouped figure template of a boy and a girl is for creating childrenswear collections. The age of the boy is about 1-2 years and the girls is about 5 years old. Use the template to design fun, colorful outfits for boys and girls or siblings. Multi-purpose fashion template showing both the front view and the back view of the design. Suitable for clothes with different and interesting details at the back or side. Use it for long dresses with slits, pants or dresses. I Fashion Templates proudly presents you our special collection of Groups Templates. Only here you can find fashion figures from different years and gender in one composition. A man and a woman group. A man, woman and a kid group. These groups are a perfect base for a more professional looking illustrations. So don’t miss this category of woderfull croquis. Choose your favourite group of templates and start drawing now!